Circular white laminate top on universal base with black center post on four-prong aluminum base, metal Herman Miller tag, ht. 28 3/4, dia. 47 1/2 in. 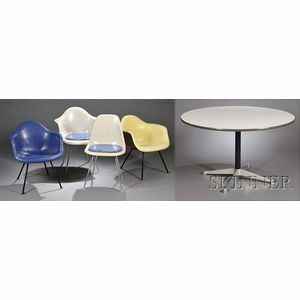 ; two armchairs, one with yellow cover, the other blue, molded shell seat with black legs, unmarked; a fiberglass armchair with Herman Miller tag on metal rod legs; and a side chair with Summit 1 stamp on base, last two raised on tubular steel legs, wear, respective ht. approx. 27 1/2, 27 1/2, 31 1/2, 31 1/2 in.